Introduce rich colours, tones, and textures to add interest and character to your monochrome kitchen. Aussies love to own a contemporary white kitchen. We can’t resist its clean, bright, and fresh vibe. However, your white kitchen can look cold and sterile after a few years. (When you’re already used to it). To avoid this, we recommend incorporating timber accents in the kitchen. 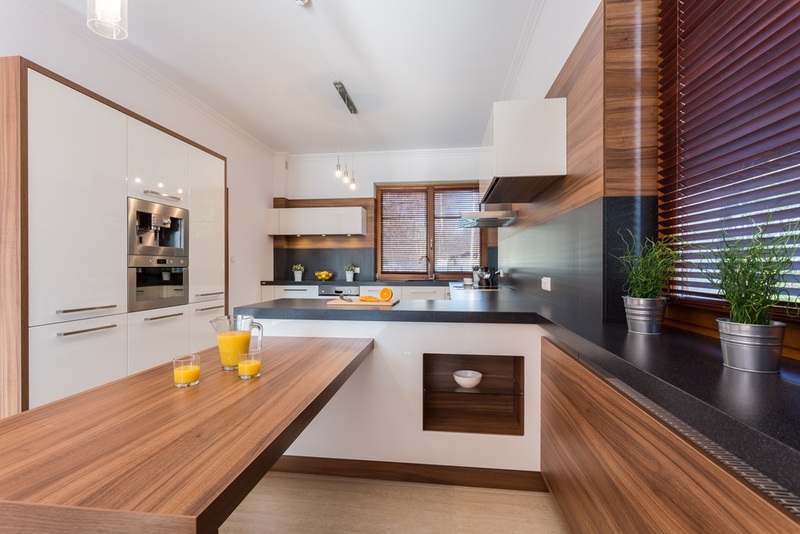 Having wooden cabinets, benchtops, floors, and furniture will add warmth to your kitchen. 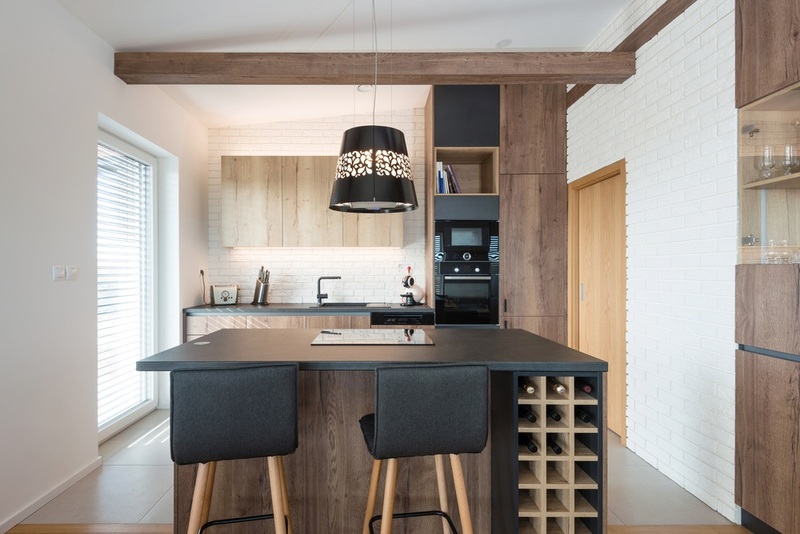 Timber with a light touch works well in white kitchens. It’s a dazzling and airy combination. Plus, the beautiful grain will stand out against the neutral background. 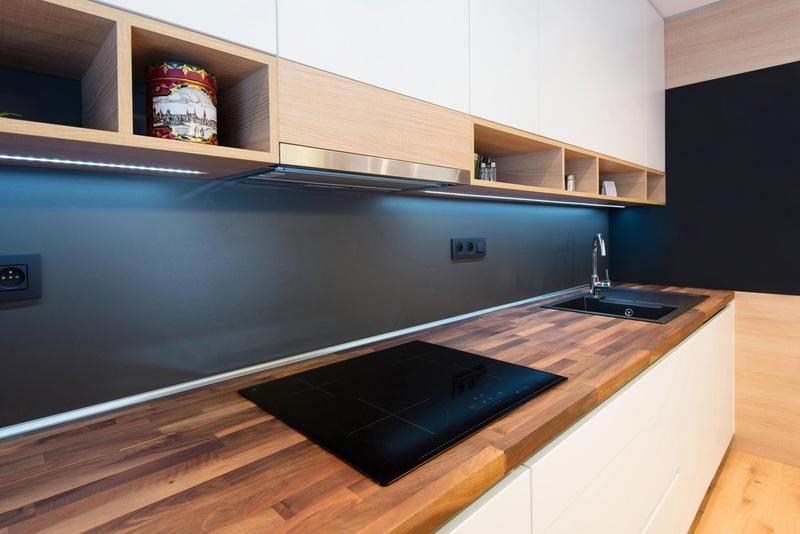 If you plan to install a splashback, choose simple designs and colours that won’t overpower the timber elements. They are the star of the show ✨ here. When possible, use a lot of wood in the kitchen. Think wooden cabinets, benchtops, floors, and furniture. Use the same timber species (or same colours) to achieve matching and seamless interiors. This contemporary white kitchen with a timber breakfast bar. For a premium look, the designers covered the edges of the full-height cabinets with wood veneer. Then, they installed sleek chrome handles on each one. Want something striking to the eye? Use black as an accent colour. Here, a charcoal splashback separates the white up and down cabinets. It highlights the gap. With the dark splashback comes bluish under cabinet lighting. The designers installed them to keep the counters well-lit. The wooden shelves and the butcher block countertop act as a border of the white cabinetry. These give the space a honey-toned warmth. In addition to the colour and appearance of wood, it also has subtle and tactile properties. 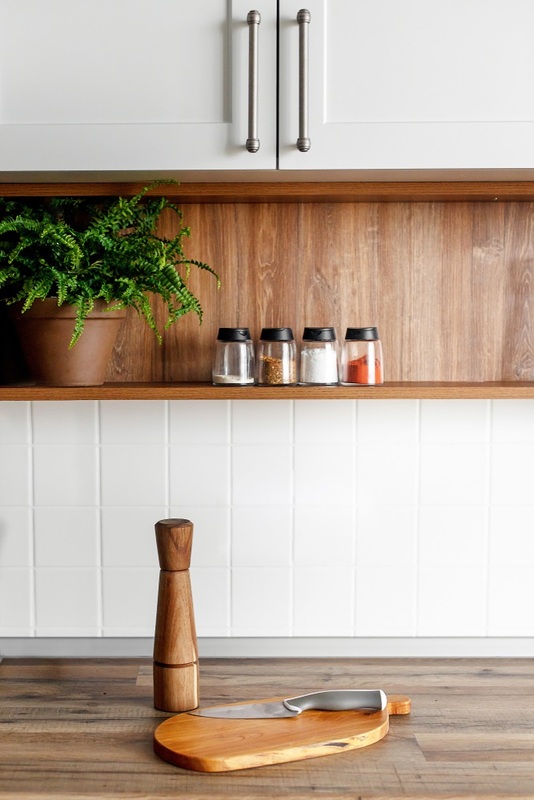 Make the timber’s beautiful grain is the eye candy in your contemporary white kitchen. Let it form a lovely continuous pattern. 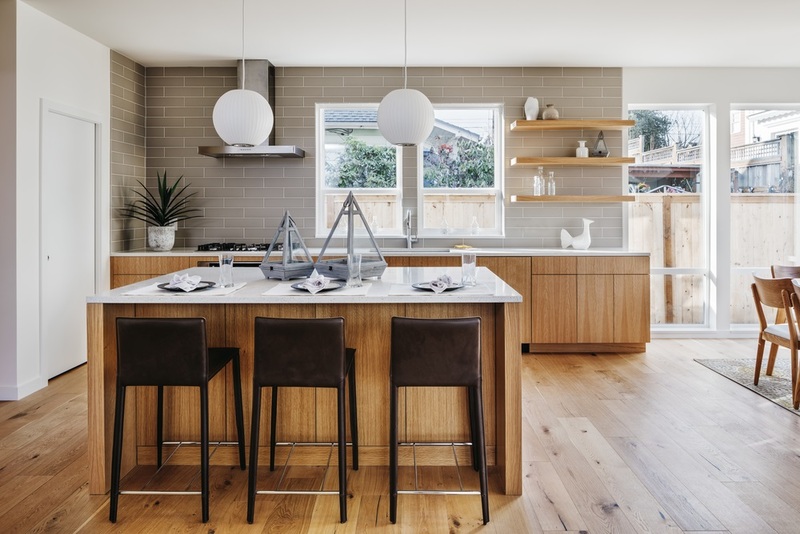 Another way to warm up your contemporary white kitchen is to use wooded benchtops or butcher blocks. A wooden butcher block countertop lends a timeless rustic charm like in this kitchen. It echoes the look of the open shelves and floorboards. There are tons of timber species used to create butcher blocks (e.g. oak, pine, iroko, bamboo). Choose the one which matches the level of durability you need. Most butcher blocks last for years as long as you maintain them regularly and seal them with a special oil. 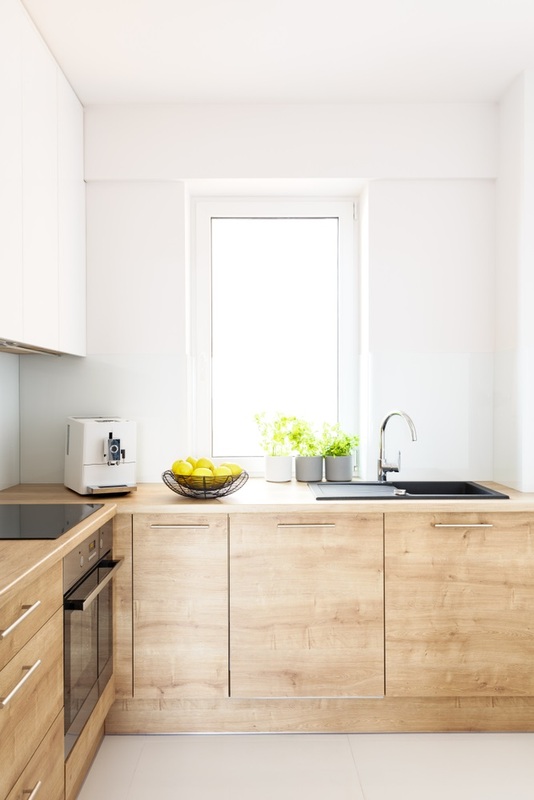 Introducing timber furniture into your kitchen is perhaps the easiest step that you can do. 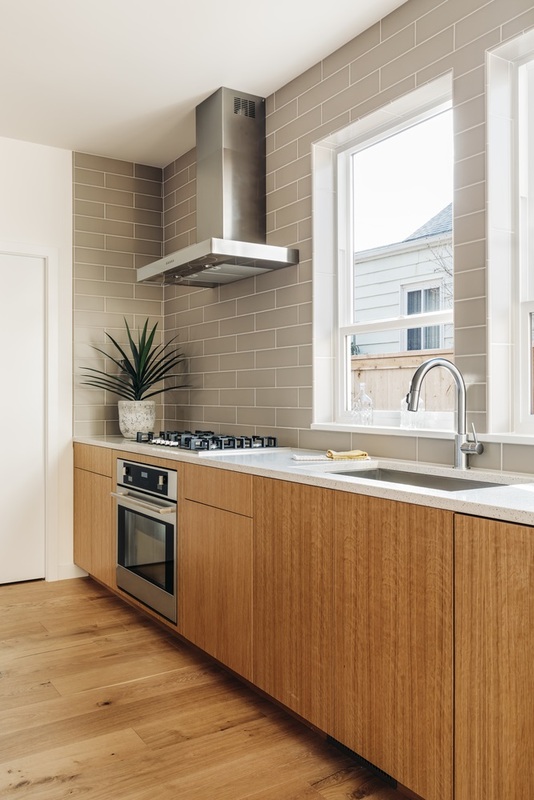 It’s a quick solution when you don’t have the time or budget for a kitchen renovation. You can change the main and built-in elements afterwards. 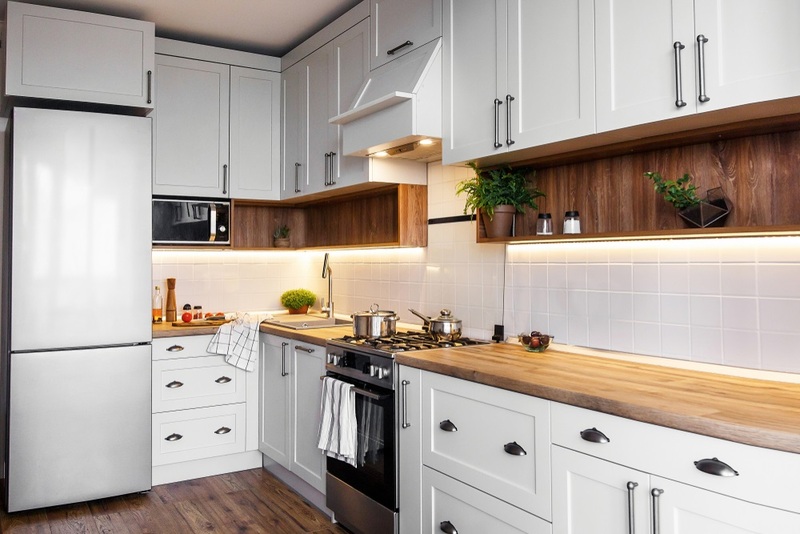 Do you like your contemporary white kitchen to have a touch of timber? Get in touch with Gold Coast architects and kitchen designers. Click the button, fill out the forms, and we’ll call you back to discuss your project.